Whether it’s for Christmas, Graduation, a Honeymoon or any other celebration, giving money just seems like the best way to go. Rarely is a gift received and the recipient ecstatic and happy with the gift. Normally friends, family and other folks either ask for something big that you do not want to spend the money on or simply ask for money. With this trend taking over, getting gifts is becoming less and less enjoyable. So you ask yourself, “How can I give money as a gift in a creative way?” Before you take a look at the 25 different ways to give money in a creative way, let’s make sure the choice really suits your situation by looking at the three options of gift giving. The art of giving tangible items was built into our genes, literally and figuratively speaking. Since the days of what we now call ancient history, giving gifts was a means of survival. Celebrations were more or less about giving additional life necessities to the one who the celebration was for rather than spoiling them with materialistic items. By following this life style, gifts soon became less of a necessity for life and more of a necessity for trading and bartering. A gift could be exchanged for another item that will help one on their life’s journey. Now, in its entirety, the art of giving transformed with the development of society. At its current stage, giving gifts is slowly dying out. Or is it? With the fast paced lifestyle and life focus on convenience, there may be no greater way of showing your gratitude in a relationship, whether it is a friend, family member, spouse or distant cousin, than giving a real gift. It shows that they mean enough to you that you would take time out of your hectic day to stop and consider what it is they may really want. While this act of giving may be powerful, it is certain you would agree that there are special cases where gift giving is not the best idea. More often than not, a person wants a gift that is far out of the monetary bounds that you wish to spend. Other times it is nearly impossible to pick a gift you know they will love. This is the perfect opportunity to get slightly creative with half the time and half the cost. For these pesky situations, there is no ample solution than to buy a small quirky gift and give money with it. This method shows that you still want to make a materialistic impact on their life, both in a creative way and an investment way. No matter the character or attitude background of the recipient, everyone has a child in them that will gladly accept and laugh at receiving silly putty and 10 dollars. Then again, the most special situations and the most common of the century are those in which either all the recipient wants is money or all the benefactor wants to give is money. So the real question is how can you give money while still leaving the impact of the first two gift giving options? As it is well known, a lot of the apprehension of giving money as a gift is the concept that by giving a real gift, the receiver realizes that you know them enough and took the time to find a gift for them, something just handing them money does not accomplish. It is not so much the gift as it is the time and effort behind it. That means the perfect gift for any occasion would be to give money in a way that still represents your dedication, your time invested and your creativeness. That is why you will find 25 different creative ways to give money as a gift below. Nothing will make the recipient look more like an entrepreneur and money-maker than creating a money tie to wear. If you are short on cash, a great way to still give money as a gift is to give the recipient a can of coins. This will make 20 dollars in dimes seem like a lot. A unique accomplishment gift is to give the recipient a lei made out of money. What will guarantee a great sleep? Stuffing a pillow with 50 one dollar bills. A great idea for achievers is to have the recipient receive 5 dollars for every major accomplishment they can list off to you. A trick that always puts a smile on everyone’s face is 20 dollars in a small box, which is in a box, which is in another box, which is in another box, which is in another box and so on. Have a book that truly impacted your life? Encourage the recipient to read it by placing money book marks in different pages of the book. 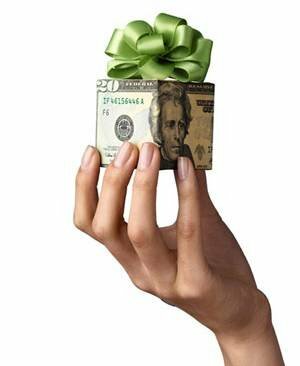 The most classic and unique way to give money as a gift is money origami. A more fun game for the recipient is to put money in balloons before tying the knot on them and have the recipient pop the balloons to see how much they receive. Scavenger hunts can be childish, but when the items being searched for get to be put in the wallet, scavenger hunts turn out to be an all age’s game. When was the last time you received a wallet or purse as a gift and there was already money in it? You can get really creative by giving different types of money: 2 dollar bills, 50 cent coins, golden dollars. If the recipient plans to travel out of the country, you could give them cash in that country’s currency. Some people drop balloons, others confetti, but the greatest gift giver showers the recipient with money. Whether the recipient is a smoker or not, giving them a box of cigarettes is always a good prank. Of course, it is filled with rolled up dollar bills instead. Often a new age favorite, rather than give money to the recipient, you can donate the money to their favorite charity or organization under their name. With regards to also giving a small goofy gift, the best wrapping paper is money. For music lovers and movie lovers, you can cover the front side of the case with money. Remember the saying; put your money where your mouth is? Instead of giving the recipient a ham sandwich, put the money in between the bread slices. Money can grow on trees if you take the time to make a replica of a tree and put money on it. The money tree is a great gift for any recipient. A common creative idea is to tape money to the underside of an umbrella for those rainy days. Give the recipient cold hard cash by freezing money in cubes of ice. Why not give the cigarette box with a matchbox that has a bigger bill in it too? Slip some money into an old prescription bottle. While laughing is the greatest cure for any sickness, combine it with medicine and the only thing left to be contagious is a smile. It’s great to find money in pockets, but also great to find it in a new pair of gloves or other clothing article. The best idea is to unroll a roll of toilet paper and then roll it back up while placing dollar bills inside. When it comes down to it, the art of giving is a transfer of feelings. No matter the gift you give, whether it is a big item, a small one with some cash, or a 50 dollar bill in the shape of a dragon, give the gift that keeps on giving. And let’s face it, the cards that have money slots in them are not the greatest pieces of work. By taking the time and effort to make the giving of money a specialized method uniquely designed for someone, you are giving them happiness. When reading this post it reminded me of something I read the other month in a landrover Book, would there be any chance I could have the authors email address, Superb blog thanks for the information.